Because it’s hard hitting journalism week here at TC (and pretty much every week in my world) I’m just going to throw this one out there: Some actual farmers in the UK have decided to turn their farm into a real life FarmVille. 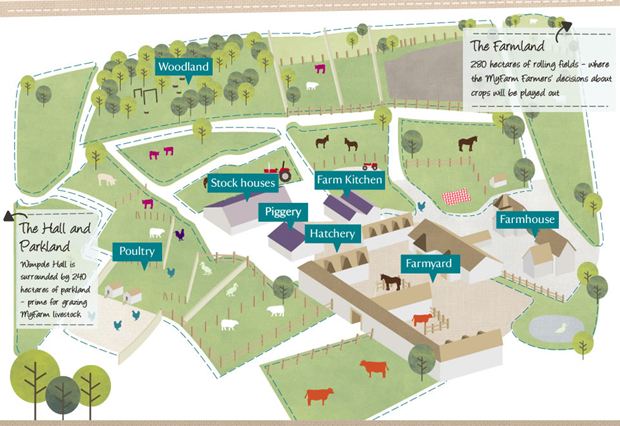 As of yesterday people who participate in the MyFarm project can buy virtual access to Wimple Estate, National Trust farm in Cambridgeshire, England. After paying 30 £ (or $48 dollars) up to 10,000 participants will vote on day to day farm minutae like what kinds of real wheat to buy and what types of real cows to raise, with their decisions being informed by blogs and videos about farm life provided by MyFarm. One “big” vote will be made monthly and the decisions with the most votes will actually get implemented on the farm. Despite cell signal on the farm being “very patchy,” MyFarm is working on a smartphone app to keep Wimple Estate manager Richard Morris abreast of online developments. Morris has been judged by backseat farmers before,“Farming is always a compromise — there is never a right or a wrong answer. If I choose one thing, my neighbour will be leaning over the fence shaking his head”. While FarmVille was part of the inspiration behind the year long project, the real goal is to forge a greater connection between people and the point of origin of what they eat, “This is all about reconnecting people to where their food comes from. Our TNS poll showed that only 8 percent of mothers feel confident talking to their children about where their food comes from. That’s really poignant,” said National Trust Director Fiona Reynolds. FarmVille is Facebook’s second most popular game at around 47 million monthly users. Farming has almost seven billion users, worldwide.